As with so much else in North Dakota, the wind decides which side of the Hebron Brick Factory you want to walk along. When the wind comes from the south, its heat and power meet the rolling hills west of the state capitol, Bismarck. That's its first interruption after building momentum over thousands of miles of flat plains. As the wind mixes with the heat of the enormous kiln at the factory's heart, temperatures and sometimes tempers begin to rise near the Grinding Plant. When the wind comes pushing insistently from the Canadian north, it whips and whirls around the 60,000 tons of tinted clay that sit in tall piles next to the factory. Ash builds up on clothes and cars and leaves a mineral heaviness in the mouth that tastes exactly like you somehow already know dirt tastes. But whatever way the wind blows at the Hebron Brick Factory, you'll undoubtedly hear, feel, taste and smell the organic process that goes into making bricks -- from mining the clay to fashioning it into shapes that will protect, decorate and insulate. Brick making is a practice that's almost as old as humankind, and it's almost instinctual to pick bricks up to get to know them. Rough or smooth. Dark or light. Thin or heavy. Held in the hand, they prompt a memory of the way bricks can be warm or cold, how they clink like teacups when knocked together, and how they are strong enough to hold up against a storm, but delicate enough to shatter when mishandled. 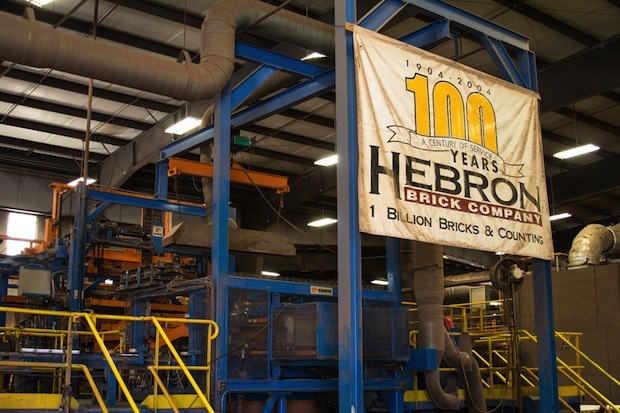 Established in 1904, Hebron Brick is a relatively recent entry in the human history of brick making. But Hebron has anchored North Dakota long enough to make it a staple of the state's identity. The local cab driver, the hotel receptionist, the pilot that flew you to the northern center of an enormous America all know Hebron Brick and know it has been there a long time. Despite the fact it feels deeply a part of the Dakota landscape, there have been plenty of opportunities for Hebron Brick to disappear. Rodney Paseka, the company's owner and CEO, bought out his partners in the 1990s and led the company on an investment program that put millions of dollars into the building of an almost entirely new factory, which now sits adjacent to the old one. The new factory opened in 2000 and saved Hebron from becoming a relic or antique brand. Paseka's changes increased production and allowed for both more customized runs of brick and standardized outcomes in production. But rather than use machines to save on labor costs, Paseka boosted production runs to keep people in work. The combination of machines and people make the inside of the factory a deeply human and modern experience. It's a living, breathing place that hums with human activity. But it also whirs and beeps as immense, powerful machines and robots dominate its buildings. Through the early 2000s, Hebron rode the wave of booming construction markets. But by 2004, Paseka was starting to feel the effects of a coming downturn. Orders began to slow. His phone didn't ring as much. So the CEO sat down to read a century's worth of notes from Hebron board meetings. The notes left him humbled and inspired. His predecessors had survived vagaries of competition and wartime as well as economic perils great and small. There was a major fire in 1926 and repeated company restructurings. Now it was time for Paseka to do his own reimagining of Hebron to take it into the future. He focused on quality first, then expanded into specialty products for restorations and even ventured into new geographies. Traditionally, bricks-heavy and expensive to transport-are made near where they would be used. But to serve more customers, Hebron created a distribution network that runs from Washington State to Connecticut. It has even shipped bricks to Japan. The company's legacy-brand bricks provide architects with the materials to match historical buildings or replicate historical styles, and the company's high-quality kilns and clays mean it can produce unusual colors and qualities of brick unmatched by larger competitors. Even though Paseka brought in new machinery, he held onto the past-and that has served him well. Along with a hundred years of notes, he has kept the traditional brick cutters filed along one wall of the manufacturing plant. The cutters look like ancient compasses for use by giants, but their delicate wires can cut unusual shapes and textures a computer can't make. They are kept in perfect shape to slice through the Dakota clay.